520 mile journey from Buffalo to Albany and into Manhattan via the Hudson River. 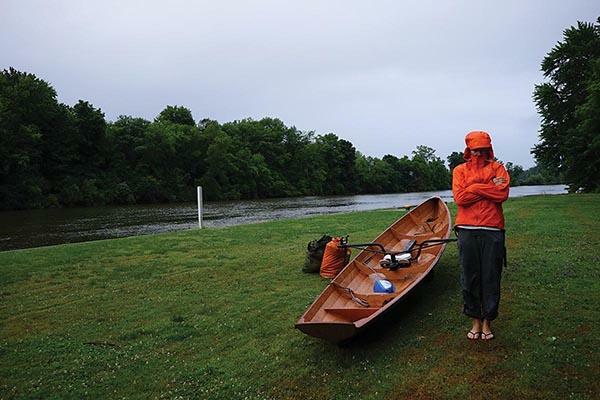 Lorenz documented her voyage with pictures, videos, and stories as she stopped at historic sites and museums along the Canal corridor. This multi-media exhibition, commissioned by the Everson Museum of Art in partnership with Light Work and Urban Video Project, is the culmination of Marie Lorenz's summer journey and features a large scale water installation utilizing two of the artist's handmade boats used to navigate the Hudson River as well as new video works that incorporate the artist's research, documentation, and materials from the voyage. Tide and Current Taxi was commissioned by the Everson Museum of Art, and made possible, in part, by a Tourism & Economic Development Grant from the County of Onondaga, administered by CNY Arts, by the New York State Council on the Arts with the support of Governor Andrew M. Cuomo and the New York State Legislature. Additional support provided by an Action Grant from the New York Council for the Humanities and Bond, Schoeneck & King PLLC. Sponsorship provided by Nicole & Michael P. Falcone; Dreamando; LLC; Bonnie & Gary Grossman; Bobbi & Clifford Malzman; and Candace & John Marsellus. The Urban Video Project will also present an outdoor screening of Lorenz's new and past works, projected on the facade of the Museum every Thursday - Saturday from dusk until 11pm beginning November 10th and concluding on December 17, 2016.